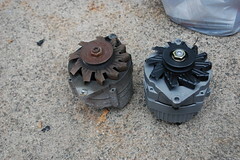 The alternator in the new truck was DOA when I bought it. I was just going replace it, but a quick bit of research showed me that an upgraded 63 amp alternator would cost the same as the original 37 amp alternator. I used this website to figure out that the correct alternator to fit the truck is the one from a 1979 Buick Regal, with the 8 cylinder 4.9L engine, & air conditioning. The big difference(besides amperage) between the two is the new one is internally regulated, removing the need for an external voltage regulator in the engine compartment. I was able to use this thread’s wiring info, as even though it is for a 12SI alternator and I’m using a 10SI the wiring is the same. 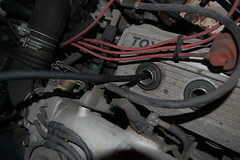 The brown wire from the dash light gets connected to the white connector wire, the thick red power wire is re-used and all the other stock wiring harness wiring is removed. Then a new wire is run from the red wire on the connector to the battery. It only took a short while to cut out the unneeded wiring, solder in the new wire & connector and bolt in the alternator. 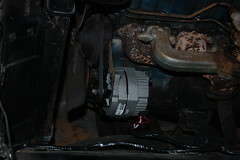 Started the truck up and the new alternator was charging perfectly. Not a bad upgrade since the only added cost over just replacing the bad alternator was the $4 electrical connector. Here is a quick tip for those who may not have seen this trick. If you are trying to change the plugs in an engine where they are deeply recessed into the head, there is a way to make it much easier. 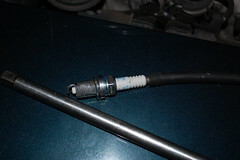 Use a spark plug socket to take them out, as the rubber donut in the socket will grab the plug and allow you to pull it out. Or use the hose on your vacuum gauge. Buy about a foot of vacuum line, and slip one end over the top of the plug. This will allow you to feed the plug down into the head, then twist the line to get the plug started. Once the threads have started the plug will stay in place enough for you to pull the vacuum line off. Finally use a normal(NOT spark-plug) deep socket to finish the job. 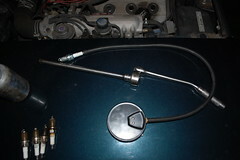 As the spark plug socket will want to stay on the plug and likely come off your extension. Done, and much easier. Oh, you did remember the anti-seize on the plug threads so it is easier next time. Right? 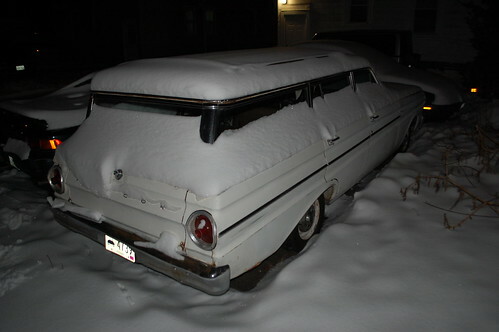 As I mentioned in the last entry about the wagon, the engine had violently overheated while trying to drive the Falcon to work. 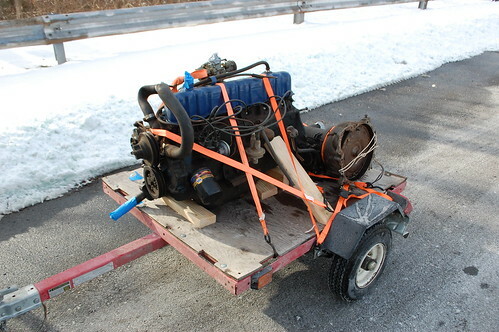 Since I already had a spare engine for it waiting, I filled the radiator with water, cut & re-routed the heater hoses to take the now blown heater core out of the circuit, and limped her home, staying off the highway. 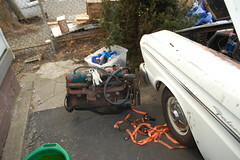 On the way home I stopped and rented an engine hoist, & loaded it in the back. While it had been bright & warm when I left work at noon, by the time I got home at 1:30 it had remembered it was early February and gotten cold & grey, with erratic drizzle. However I was already going to have to pay for the engine hoist so I pushed on with the swap anyway. You can see however why taking photos was not my priority. I started disconnecting things, sawing off radiator hoses and generally swearing up a storm. After about an hour I had the motor disconnected to the point where I could start actually pulling. Ford sixes have no good place to hook up chains to yank them, ,so I ended up using two ratchet straps from my trailer to form slings front & rear. With my girlfriend manning the engine hoist I pushed pulled, pried & kicked the engine free of the transmission and guided it out of the engine bay & down to the pavement. 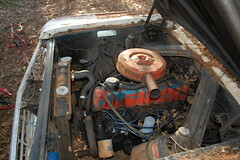 Once the old lump had been pried free, there was a bit of jockeying engine hoist & straps to get the “new” engine secured. Then that was lifted, swung around, and dropped into place. Ok, that last sentence is technically correct, however what it leaves out is the 1.5 hours that it took pulling, prying, levering, shoving, swearing, bashing, cursing, praying, etc. 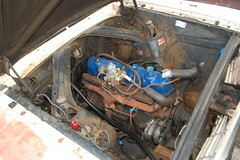 to get the engine & transmission to line up and slide together. I hate putting engines in when the transmission is already in place, and doing in a cold driveway while being drizzled on does not improve the experience. 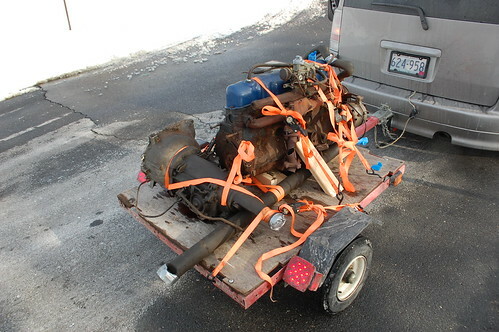 Once the engine was in place and bolted to the transmission and frame, the engine hoist was disassembled & loaded into Box to be returned and I went upstairs to shower off. Over the next few weeks the cold weather hung around, and once it started to lift my work went on insane amounts of mandatory overtime. So the wagon sat with the engine in place but other wise unattached for almost a month before I could carve out some time to start reconnecting everything. Most of it went smoothly, and with few surprises. I couldn’t help but be amused to use guides I had written up myself to rewire the car for an alternator & modify the radiator support to fix an thicker radiator. The only issue I had was swapping out the cracked exhaust manifold for the good one from the old engine. That was enough of a project to warrant it’s own blog post, so that will be coming soon. New toys for the wagon! This weekend I was able to pick up this pile of new bits for the wagon. 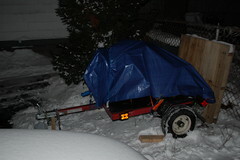 Bright & early Sunday morning I dug the xB & my little utility trailer out of the snow and headed to CT. There I met up with a gentleman who was rebuilding his wife’s 1966 Mustang and was upgrading it to a newer Thunderbird 3.8 V6 & 5-speed. 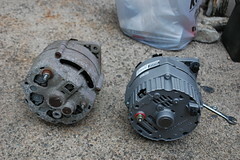 I was able to buy the original 200ci six, C4 transmission, driveshaft and a box of parts & accessories for only $250. In addition to not having a bad valve, the motor has only 77K miles on it, and allows me to in the same package get a 60 amp alternator(instead of my 30amp generator), automatic choke, and a carb that isn’t leaking gasoline. It does need an exhaust manifold as these are prone to cracking, however the one on my old motor is good. 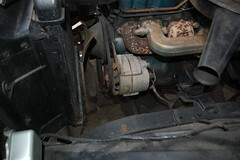 Also the distributor bushings are worn so it slowly goes out of tune. I’ll be trying my distributor, and if that doesn’t work a remanufactured replacement is only $50. I’m planning to stab the motor in as soon as possible, but the transmission is going to have to wait until at least the spring as going from the 2-speed Fordomatic in the wagon the 3-speed C4 requires a bit more adapting (new driveshaft, transmission crossmember and custom linkage). Not sure when I’m going to get a chance to swap the motors, so until then everything is sitting wrapped in a tarp on the trailer. This is the joy of trying to get stuff done on a car in New England without a garage. You never know when your work area is going to be under several inches of snow.